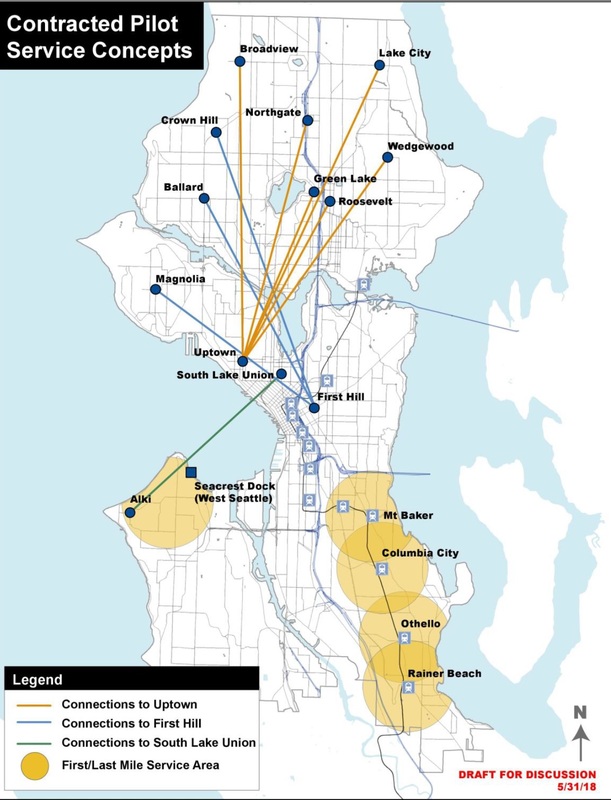 This afternoon, the Sustainability and Transportation Committee voted to recommend approval of some changes to the Seattle Transportation Benefit District plan. It includes a high-profile proposal from Mayor Durkan, and another interesting program that is slipping through almost unnoticed: a limited private bus system. 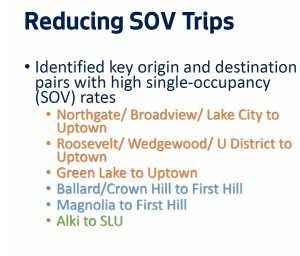 The STBD is a voter-approved tax to increase transit service within Seattle and grow programs for low-income residents to access transit at a deeply discounted rate. Mayor Durkan has pitched an ORCA Opportunity program, which would give ORCA passes to Seattle Public School students; that would cost about $4 million per year ($2 million for the second half of 2018, assuming it rolls out in July). SDOT has also been working hard to understand where the city’s growth and traffic messes have created the most commute pain. It is also looking ahead to the “Period of Maximum Constraint” when the convention center and the waterfront projects snarl traffic downtown and the extensions to the light-rail system have not opened yet. 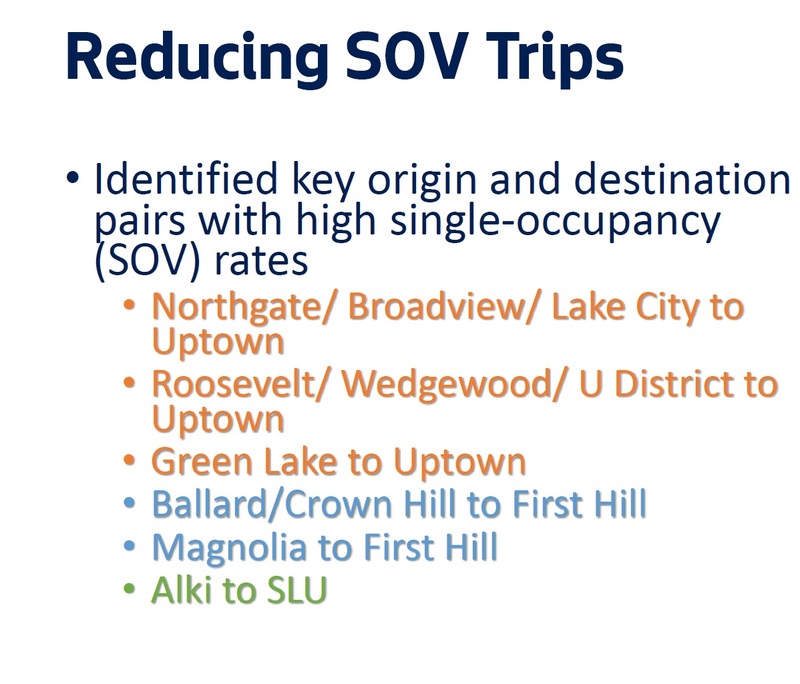 SDOT’s goal is to reduce the number of single-occupancy trips per day by 3,000; that’s an aggressive number that will take a collection of programs to reach. However, at the moment Metro is being less than helpful with this effort; it’s running at capacity during peak hours, constrained by the number of buses it owns and the number of drivers it has to operate them. 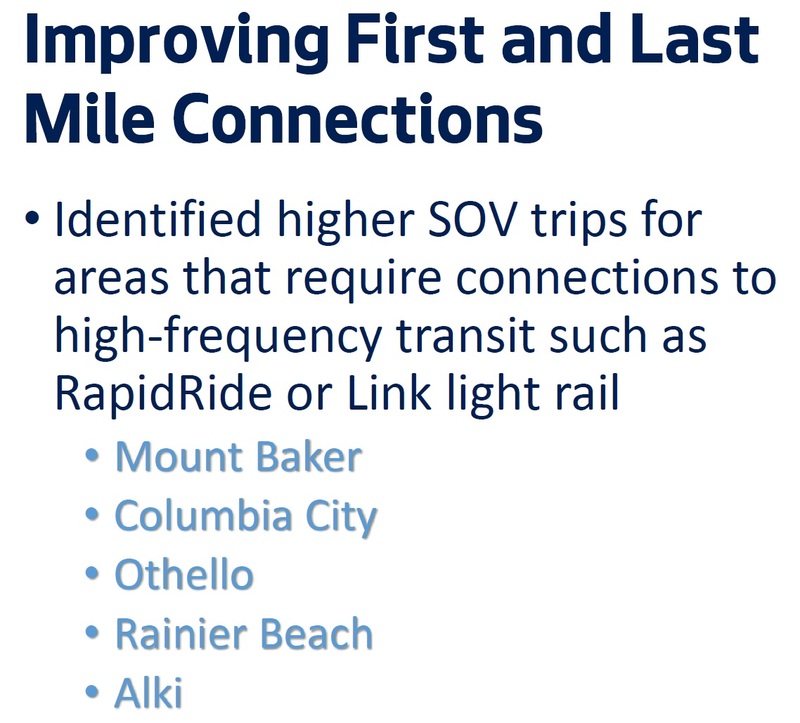 While SDOT has a list of routes that it would like additional service added to during peak hours, Metro can’t comply and instead is focused on expanding during off-peak hours as part of its “all day service” initiative. Since Metro can’t help, SDOT is pitching an alternative: contracting with a private company to run special bus service along routes it selects. 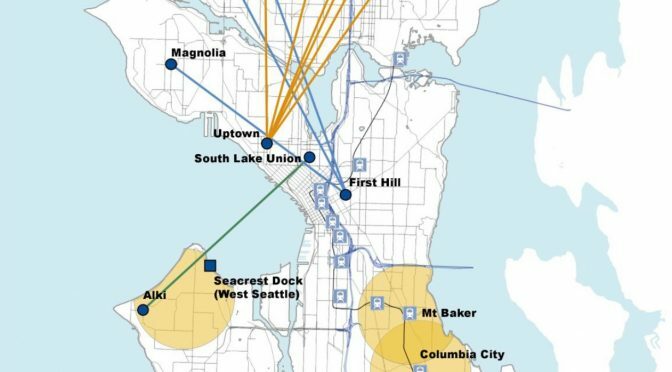 Based on survey data, it has identified common point-to-point commute routes that Seattle residents make, as well as common routes that feed people to light rail and Rapid Ride stations. It is proposing to contract with buses to cover those, relieving some capacity for existing bus routes, and hopefully eliminating some bus transfers downtown to eliminate the number of people whose commute takes them through the most congested part of the city. 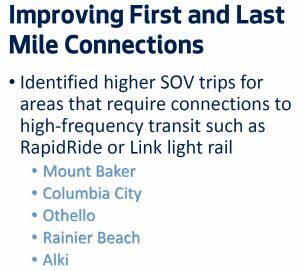 Their data showed them that Uptown and First Hill were two popular end-points for single-occupancy-vehicle commutes from the north end. Also, there are a lot of people driving from Alki to South Lake Union. So those are the top priorities for adding bus routes. In the south end of the city, the contracted bus routes would be focused on getting people to and from light rail and Rapid Ride stations. Their estimate is that these extra routes would cost about $7.5 million per year. Between the two programs, that would mean an additional $11.5 million per year starting in 2019. 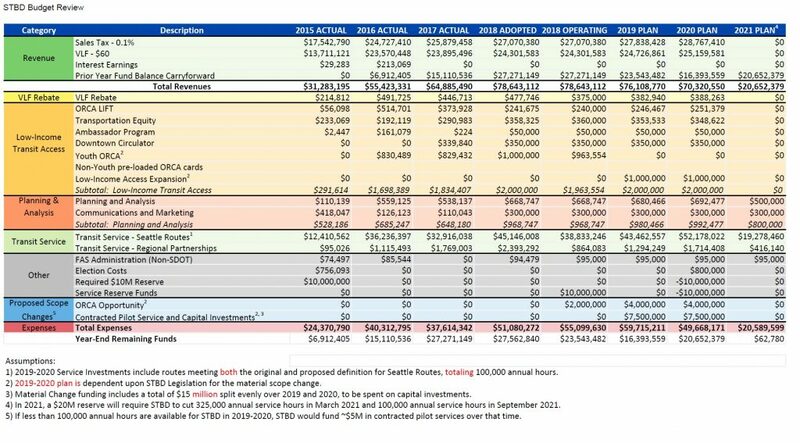 Fortunately, it looks like the Seattle Transportation Benefit District has the money: it has been running a surplus the past few years and carried a fund balance of $27 million into 2018 (click to expand below). There are still several issues to be worked out, including finding companies to operate the service, determining the size of the buses, negotiating labor agreements, establishing fares, and integrating into the ORCA pass system. 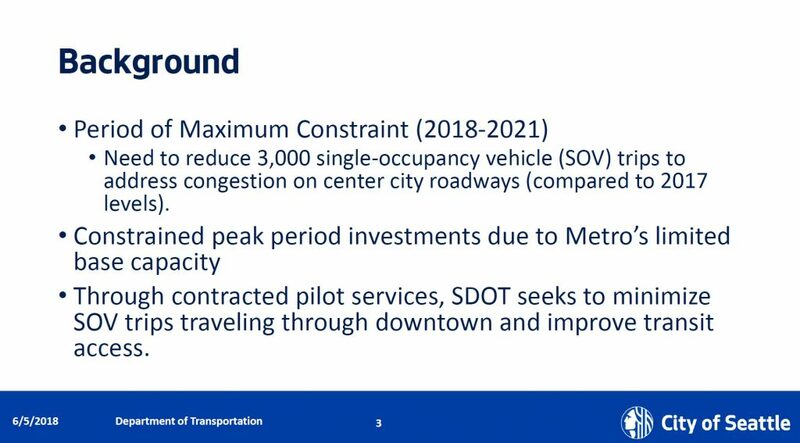 Also, the Council amended the Mayor’s proposal, placing a $5 million limit on the funds that could be used for the privately-contracted bus service, and putting a proviso on rolling out the service until the Council passes a separate ordinance allowing it — which gives the Council a chance to personally approve SDOT’s solutions to all of the outstanding issues. With the bill voted out of committee this afternoon, it proceeds to the full Council meeting on Monday for final approval. The bill also relaxes the rules as to which Metro lines STBD funds can be used to expand service on, and allows for greater investment in capital projects to improve transportation system efficiency. The Mayor’s office was quick to issue a press release this afternoon praising the Council for voting the bill out of committee. Previous PostSo how’s that dockless bikeshare pilot going?Next PostWednesday news roundup: bike share! Wow.Find effective solutions & be innovative.